Bonaire – March 8 is a monumental day when Constantin “Patun” Sargoza and Elton “Taty” Frans windsurf from Bonaire to Curacao. The event is a fundraiser for Bonaire’s own Erwin Muller. Erwin, a dive master and former windsurf hero on Bonaire suffered a serious stroke in January. He is recuperating in Curacao and has a long rehabilitation ahead. Erwin is well known in the community for being a man who loves adventure whether it’s riding his quad or delivering a yacht across the Caribbean. Locals and tourists are rallying to support Erwin and his family, Ellen and Jason. 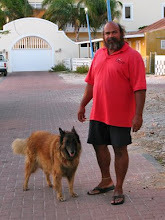 The March 8 race is dedicated to Erwin, one of the original founders of windsurfing on Bonaire. Saragoza, a former Olympian will race across to Curacao with Pro Windsurfer Taty Frans. Taty, one of the top freestyler’s in the world recently circumnavigated the island in 2008. He is perhaps the fastest slalom sailor presently on Bonaire. The race commences at 9 AM outside BOPEC. Spectators are welcome for the send off. Helicopters and chase boats will accompany the two sailors across the passage. The record set back in the 80’s by Erwin is 4 hours. They will race to Light House Point on the East side of Curacao and then head down to the pier near Breezes Resort. Donations for this fundraiser may be contributed via Paypal to: Erwin2CanDive@gmail.com. For those wishing to accompany the flotilla it is important you speak with Elvis Martinus by calling 786 2288 for clearance. The safety of the two windsurfers is paramount. This is a very exciting yet intense voyage. We wish them well as they race for a fellow man of the sea, Erwin Muller.